Another chance to get the truth out…. « WHY ORGANIC: This is a test of free speech. This is only a test. Salt Lake City’s Secret Pyramid for Mummification ???? See this. 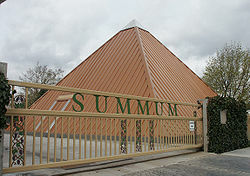 The Summum Pyramid is a sanctuary and temple used by the organization of Summum for instruction in the Summum philosophy. It is located in Salt Lake City, Utah, and was built during 1977 to 1979. The pyramid is 40 feet long at the base, 26 feet high, and is oriented towards True North of the Earth. The structure also incorporates the Divine Proportion in its design. The pyramid was licensed as a winery in 1980 so that Summum could produce what it calls “Nectar Publications,” drinks containing alcohol that are used in practicing the Summum Transcending Meditations. The pyramid is also used to conduct the rites of Transference. Summum provides the service of Modern Mummification, and as part of the service, rites of Transference are performed to help guide the spirit or essence of the deceased to its next destination in existence. WHAT SUM ARE THEY MUM ON ???? You know that Salt LakeCity is nearly all Mormon rght? THIS IS BIZARRE….. I cannot get this to post at my WHY ORGANIC BLOG. IT IS FROZEN RIGHT NOW, NOR COULD I ADD THE TAGS, MORMON OR LDS. This entry was posted on January 23, 2008 at 4:27 am and is filed under Politics, religion. You can follow any responses to this entry through the RSS 2.0 feed. You can leave a response, or trackback from your own site.